WHAT DIFFERENT TYPES OF FACIAL PROSTHESIS ARE THERE ? Facial prostheses are mainly available in two different materials: porous polyethylene prostheses (Medpor©) and silicone implants. There are several types of facial implants: chin prostheses or chin implants, cheek prostheses or malar implants and mandibular augmentation prostheses. Porous polyethylene prostheses are used in current practice in the field of craniofacial reconstruction and for aesthetic surgery augmentation. The structure of the implants is a matrix that is colonised by the patient&apos;s tissue, producing biointegration of the prosthesis and preventing any subsequent movement This benefit becomes a drawback when the prosthesis has to be taken out (the extraction is more difficult). The structure of the Medpor© prosthesis is like a synthetic bone, allowing it to be fixed in place using microscrews that prevent rotation (during biointegration). As regards the silicon implants, these are fixed to the tissue with the aid of stitches which ensures their stability, as well as making the procedure even more effective. Medpor© prostheses have a harder and less flexible consistency which can make insertion difficult, sometimes requiring a slightly larger incision than a silicone prosthesis. The Medpor© range of implants is more restrictive than silicon implants. The range of silicon implants available is very developed, which enables it to be adapted to almost all anatomical situations. The placement of these implants is more difficult than silicon implants. WHAT ARE THE ALTERNATIVES TO FACIAL IMPLANTS? An injection of fillers (hyaluronic acid, Radiesse™) can be used but have the drawback that the results are only temporary. A genioplasty using advancement osteotomy is an excellent option. Its result is definitive and totally natural. Lipofilling is not a good indication for increasing the projection of the chin but a good option for softening certain contours and optimising the result of a chin implant or genioplasty. Lipofilling is sometimes a good option. During consultation, Dr. Victor Médard de Chardon determines the best treatment option for your face, depending on your anatomical features. Hollow cheeks have an ageing effect on the face, making it look tired. Cheek augmentation using implants gives volume to the cheek by actually augmenting the bone structure of the cheek region. If you have lost malar volume with age, or if you naturally have thin cheeks, you could be a candidate for cheek implants. Some patients have already benefited from hyaluronic acid injections, a temporary solution, and are looking for a permanent solution. Aesthetic cheek surgery can be done on its own or in combination with other surgical procedures. There are many shapes and sizes of implant available that can be tailored to your particular anatomy and to the desired modification. Cheek implants can be inserted via the mouth through a small incision in the gums, or via the lower eyelid. An eyelid incision is recommended in older patients or when combined with a blepharoplasty. An intra-buccal incision is recommended in other cases. The drawback of the intra-buccal route is the high risk of infection of the implant. A pocket is created to size and the prosthesis is inserted. The cheek implant is then sculpted to suit the local anatomy and the desired result, and the prosthesis is finally fixed in place using microscrews or stitches. The incision is then closed up using resorbable stitches. Aesthetic chin surgery restores the balance of the face in profile. Chin augmentation using an implant is the procedure of choice for most patients presenting no bite abnormalities or maxillomandibular disharmony requiring osteotomies. A Medpor© biocompatible implant or silicon implant is inserted over the bone structure of the lower jaw, augmenting the dimensions of the jaw. Depending on the size and placement of the implant, a stronger, wider or longer chin can be created. 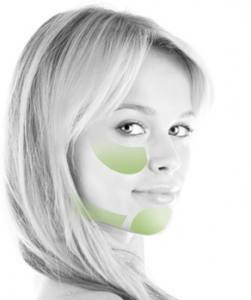 Furthermore, an augmentation of the projection of the chin can enhance the neck. If your chin is recessed but you don&apos;t have any bite abnormality, you are a good candidate for chin augmentation with a prosthesis. A submental or endobuccal incision (inside the mouth) is performed. A pocket is created on the chin bone and along the mandible. The implant is inserted, sculpted to measure, and fixed using microscrews or stitches. The incision is then closed up using resorbable stitches. The immediate result is slightly increased by oedema, the extent of which varies between individuals, but which mostly disappears in 14 to 21 days. The final result can be seen by the 3rd month. Bruising can sometimes occur, but resolves naturally in 14 days. There is only slight pain with a chin prosthesis, usually felt when chewing or speaking. There are no stitches to remove. Scarring takes place in 14 to 21 days, but the appearance of the scar is not final until 1 year after the operation. Social activities can be resumed within a few days. Infection of the implant. In spite of all precautions being taken (asepsis, antibiotics), an infection is statistically possible. The treatment is simple, requiring the temporary removal of the prosthesis for a duration of 6 months and antibiotics for 14 days. The risk of a displacement is lower with Medpor™ implants due to their biointegration. Despite the in situ sculpting of prostheses, the contour of the implants is sometimes visible under fine skin. Softening of the contours by injection of hyaluronic acid or a microinjection of fat is then performed. Consultations take place at the aesthetics surgery clinic in rue d’antibes, Cannes. The operation takes place at the clinic in Cannes or Nice. Hospitalisation: outpatient, admitted in the morning and discharged in the afternoon.